Happy Hour Benefit at Flyway! Hello all! 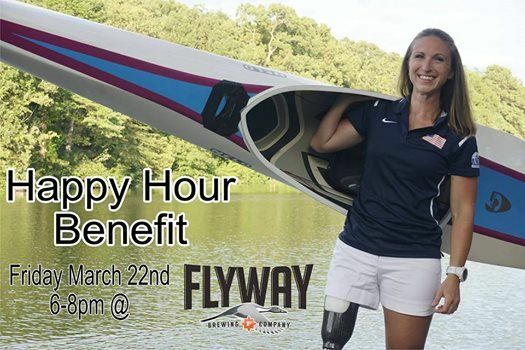 Flyway Brewing is hosting a benefit to raise money for my Team USA kayak training fund. $1.00 from specific pints will be donated to my cause. There will also be a prize drawing, with tickets costing $10 and prize packages up to $100.00! This event happens March 22nd, the Friday before I leave for the Chula Vista Olympic Training Camp!! Come have a beer and say hi!! I have a very exciting sprint season coming up! I was invited to attend a training camp at the Chula Vista Elite Athlete Training center March 27 through April 6th. https://trainatchulavista.com/ . This kicks off the 2019 sprint season. Aug 21-24 World Cups, Szeged Hungary. This fundraiser is to help offset the expenses of travel, competition fees, boat rentals at the events, food, and time away from work. Also a great chance to catch up with so many of you!! Looking forward to see everyone soon!